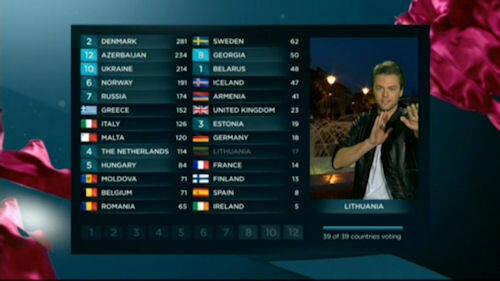 For all those people who are interested in the Eurovision Song Contest, here are the results for 2013. The voting was the same as 2012. The viewer takes 50% of the vote the jury in each country have the other 50%. The voting changed to start after all the songs were heard and for only 15 minutes. The presenter was Petra Mede. The semi final 1 was broadcast on Tuesday 14 May 2013, 2 hours long. The semi final 2 was broadcast on Thursday 16 May 2013, 2 hours long. The final was broadcast on Saturday 18 May 2013, 3 hours 30 minutes long. What was weird that the winner was announced when there were 4 countries left to vote. First Results appeared here at 00:03 UK on Sunday 19 May 2013. Slightly later than before due to the contest finish late! Denmark won the semi final 1, Russia finished in 2nd place, Ukraine finished in 3rd place. Azerbaijan won the semi final 2, Greece finished in 2nd place, Norway in 3rd place. For Background Details to the 2013 Eurovision Song Contest, please click here (not much this year!! ).